If the Grand View Point Trail doesn’t knock your socks off, I believe you’re bound to be bored with everything else on earth. This was Hike 27 of my 52 Hike Challenge, and what a great way to kick off the second half of this project. The day started with an incredible sunrise that I enjoyed from my comfy tent. The previous day we had hiked a bit in Canyonlands, but far away in the Needles District. Due to the Green River flowing through the park, there’s no quick way to drive from one district to the other. After a very long night of driving we set up camp at Horsethief Campground, then headed into Island in the Sky for more hiking. Upon our arrival at the Grand View Point trailhead it was clear how this area got its name. The hike follows a mesa that sits high above the carved out canyons, just like an island in the sky, providing jaw dropping views of the landscape. The trail is quick and easy and impossible to lose. You just follow the thin strip of land out to a viewpoint and back. I wouldn’t call this hike particularly exposed, but you can walk right up to (or off of) the edge of the steep, sheer drop off edges of the mesa. Don’t expect a rail to protect you – there isn’t one. Upon reaching the view point there are some rocks to scramble if you like which also provide some nice shady spots to sit and take a break. Since we hiked in August it was quite hot on a cloudless day, so finding a shady spot to drink some water and rest was pretty exciting. 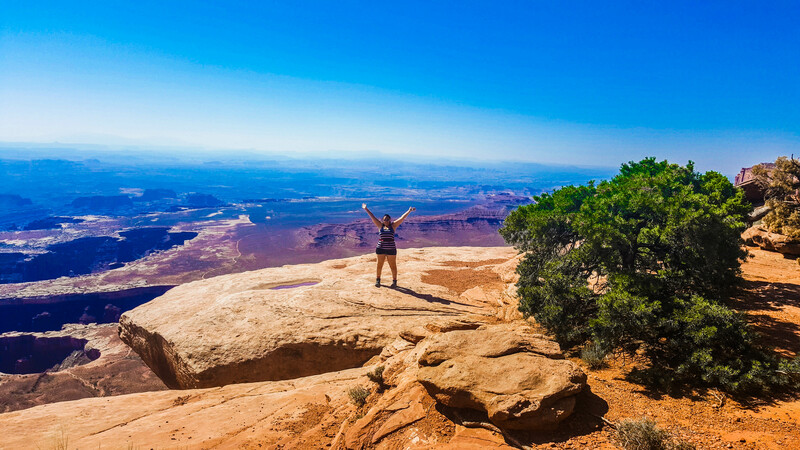 Don’t forget to always carry water when you hike, but especially in an environment like Canyonlands where water is not available. Overall I’d recommend this easy hike to anyone. It’s pretty flat and impossible to lose the trail. Just remember sunscreen and water and you’re set! Have you hiked the Island in the Sky? Tell me about it in the comments!